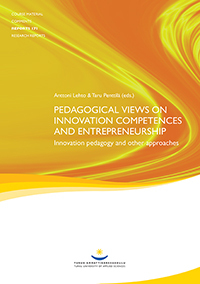 This article collection discusses pedagogical approaches to enhancing innovation competences and entrepreneurial attitudes in the context of higher education institutions. The focus of the book is in the desired learning outcomes relating to these competences and attitudes. The texts are aimed at staff members of universities of applied sciences as well as all the planners, developers and decision-makers partaking in activities relating to higher educational institutions. The articles have been grouped into two themes. The first half comprises texts that look at cultivating innovation competences in students before their transition to working life. The latter part focuses on entrepreneurship in the same context by presenting good practices for teaching students how to succeed as an entrepreneur. The book begins by outlining the concept of innovation pedagogy adopted at Turku University of Applied Sciences. This collection of articles has been contributed to by authors from all CARPE members. CARPE (Consortium on Applied Research and Professional Education) is a strategic network for joint applied research projects and curriculum development in the field of professional education. Click on the "Lisää koriin" button to order the book. Click on the green "Lataa E-julkaisu" button to load the e-book for free. This copyrighted material can be downloaded and printed for private use. Commercial use prohibited.